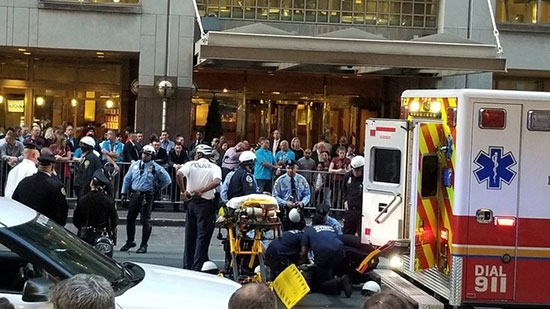 Three members of the Philadelphia Police highway patrol motorcycle 'drill' team were injured on Sunday evening while performing in Center City. It happened around 5:30 p.m. at 12th and Market Streets. The officers were performing a stunt for the International Association of Chiefs of Police Convention when their bikes became entangled causing the crash. Two of the officers were taken to Hahnemann University Hospital by other officers at the scene. The third was taken there by medics. All three have been treated and released from the hospital. Two men were struck and killed in Dewey Beach, DE on Saturday afternoon. It happened around 5 p.m. on Coastal Highway. The pair were standing out front of the Starboard Bar and Restaurant when a Chevrolet Suburban crossed lanes and headed towards them. They tried to get out of the way but could not. The driver of the SUV was a 61-year-old man from New York. Police say that he suffered a medical issue and blacked out at the wheel. The two victims, ages 53 and 58, are from Washington, DC, but have not been publicly identified. No charges have been filed. Police are still investigating. Justin Timberlake has officially been announced as the headline performer for the Pepsi Super Bowl LII Halftime show. The Super Bowl is scheduled for February 4th, 2018. Timberlake last performed for Super Bowl XXXVIII in 2004 when he was part of the notorious wardrobe malfunction with Janet Jackson. He also performed for Super Bowl XXXV in 2001 with *NSYNC.